Le Québécois grain-fed veal is never given growth hormones. Le Québécois grain-fed veal is never given antibiotics as a growth or preventative tool. Le Québécois calves are raised on a natural diet of corn, whole grains, milk-formula, and fresh water. 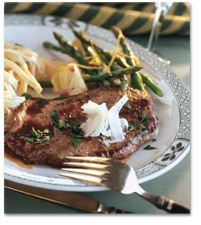 This diet gives Le Québécois Grain-fed veal a pure and natural taste. The Le Québécois Veal traceability program tracks each calf's movement from birth at the dairy to the retailer or restaurant. Calves wear an electronic button and a bar-coded ear tag from birth through all stages of production. The animal's identification number corresponds to the final boxed product. Traceability technology allows Le Québécois' producers to monitor the movement of its products up or down the production and distribution network. The goal of traceability is to provide its customers with confidence and to ensure that the veal is of the highest quality. …the successful management of agricultural resources to satisfy human needs while maintaining or enhancing environmental quality and conserving natural resources for future generations. …to sustainably managing the soil and water upon which their livelihood depends. The small farming families that raise Le Québécois calves depend on the land that they are intimately connected to. …to maintain responsible ecological practices regarding livestock husbandry, soil and water management, waste management, and the elimination of chemical and mineral surpluses. Le Québécois farmers adhere to stringent government regulations that prevent animal waste from contaminating ground water or the local ecosystem.